Unless politicians in the U.S. can come to an agreement before midnight tonight, 800,000 government workers will find themselves locked out of work tomorrow. The original plan was to write a long detailed post about what departments were going to be affected but The Washington Post has compiled all the information you need right here. The Republicans are insisting that Obamacare be essentially killed in any deal they will accept. Obama has said that he will veto any bill that tries to kill the new healthcare. So now it is a waiting game. If everything gets resolved by midnight then everything goes back to its normal broken state. If not, then those 800,000 workers will not be getting paid starting tomorrow. It is probably worth mentioning that politicians are not among the 800,000, they still get paid. The people that are causing the shutdown will still get paid. So tomorrow we could have 800,000 unpaid, angry Americans watching on TV as politicians that make $175,000 year talk about how it is a tough situation all around. 800,000 unpaid workers means 800,000 less consumers. This would have a massive knock-on effect. It has been mentioned many times on this site but I will mention it again; the U.S. buys 75% of our exports. If the US economy stalls because of this then Canada’s will not be far behind. If the shutdown happens then the next big date is October 17th. This is the day the government will run out of money. If nothing gets resolved tonight then I will post about the possible consequences of the US defaulting on debt payments. On Monday Stephen Harper announced that he will ask the Governor General to prorogue parliament. This means the House and the Senate will remain suspended instead of resuming in September as expected. Although Stephen Harper has used this technique in the past to avoid things like confidence votes this time it is seemingly less devious as he has just shuffled his cabinet. The idea is that he is trying to give his new cabinet ministers time to get to know their new roles. Some will argue that he is simply proroguing to avoid questions about the Senate finance scandal. In the past, Harper has made a point of avoiding questions both in the media and in the House whenever something tough is asked of him. He will simply shrug Senate spending questions off, avoid them, or answer with some sarcastic comment. What we want to look at in this post are any other incentives Harper might have for proroguing that Canadian parliament. First, and most obviously, parliament is suspended. There has been no set date for them to return. The Conservative party convention is sometime around Halloween so it is possible that we will not see parliament back in session until November. The second effect is more important. All bills before the house that have not received Royal assent will “cease to exist”. According to the government there are currently 447 bills before the House, the Senate or in committee. All of those will be cancelled. 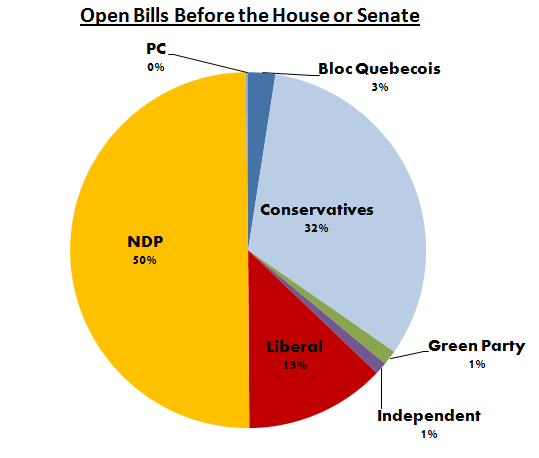 Below you will find a breakdown of all the open bills by political party. Here is the main problem. Does the House need to agree on each of the bills individually or is it an all or nothing deal? The “detailed” version of the Parliamentary Cycle website regarding prorogation is not clear. Since it is the government, I will assume the worst. So if the House, where the Conservatives have the majority, agrees to let those 223 NDP bills be reinstated then there will not be much effort lost by starting a new parliamentary session. I suspect however that the NDP will be forced to reintroduce every single one of them. To be fair, only 72 of those 447 bills have made it to first reading. The rest are still waiting for that privilege, I assume. The government website is not entirely clear on why the numbers are so different. On the other hand, the 144 bills that have been introduced by Conservative members will face the same House decision and will likely be reinstated. This seems like a very easy way to get a majority government’s bills bumped to the front of the line. Today, Dalton McGuinty, leader of the Ontario Liberal Party and Premier of Ontario, announced that after nine years he would be stepping down. At this point you may be cheering or crying or not caring at all, but I assure you that in the next little while we are going to hear about all the good and bad things that the Liberal party has done during their time in power. I am not going to write about every decision during that period that I agree or disagree with but I thought that now would be a good time for a quick mention of one project that does not get enough time in the press. The Niagara Tunnel Project. Started in 2005, this is the project that dug a 10km long, 14m in diameter tunnel under the city of Niagara Falls. The tunnel will be used to bring more water to the existing Sir Adam Beck power generation station at the base of the falls. The tunnel itself is complete and they expect the power generation to start in 2013. Total output should be about 1.6 billion kilowatt-hours per year which is, in the more popular measure, enough to power 160,000 homes. This is a project that both the Conservatives and the Liberals supported, something you do not get that very often. Yes, it was five years late and yes it cost $1.6 billion instead of $935 million but I still think this is something that people should be hearing about more frequently. The problem is that most of the time you get reports that are very similar to what I have just written, full of boring numbers. Instead we need more pictures and videos – this tunnel is an extraordinary engineering achievement. So here you are. That is a link to a history of the tunnel with pictures and a couple of videos. So whenever you start to think that the government is incapable of getting anything right just remember this amazing project and maybe it will help restore a bit of confidence. This tunnel is designed to provide power for a hundred years. I doubt the citizens of Ontario in 2113 will be thinking The clean, easy power is nice but do you remember the Liberal eHealth boondoggle of 2009? Want to read more about the tunnel? Here is the official site. Currently the Canadian government is trying to decide whether or not they should allow the Chinese National Offshore Oil Corporation (CNOOC) to purchase 100% of Nexen, a Canadian oil company that operates in the Alberta oil sands. This is going to come down to our old friend “net benefit”. I must always be sure to include the quotation marks because its definition has never been clear. Some time ago I wrote about the how the Canadian government had blocked the sale of Potash Corporation to BHP, an Australian company. I ended that post hoping that the government would eventually explain the exact reasons for blocking the sale but they never did. The consensus in the media seems to be that there was no way we could sell the Potash Corporation because it is unique and it controls a huge amount of the world’s potash supply. Nexen on the other hand only controls about 5% of the Alberta oil sands and so everyone seems to think this deal will be allowed — under certain conditions. Conditions like keeping the Nexen head office in Canada with at least 50% of the board being Canadian, keeping 80-100% of the current workforce levels and maintaining the company’s commitments for capital investments for a certain number of years as well as posting the company’s stocks on the TSX. This is where you say Hey that does not sound very much like a free market to me! You are correct. In the Potash post I mentioned that at the meeting of the G20 countries the Canadian government said they would refrain from adding any new trade barriers and then went ahead blocked that purchase anyway. Maybe now they will say that by allowing this new deal they are honouring the commitment? There needs to be some consistency. The current government hates getting involved with running companies. Remember the Canadian Wheat Board? I wrote about it a few posts back. That was an evil State Trading Enterprise (STE) that sucked profits from hardworking Canadian farmers. We had to get rid of it because a government had no place in markets. You may have already guessed where I am going with this. A quick look at any reliable source of information will tell you that CNOOC is a Chinese STE. That is correct, it is owned by the Chinese government. So while our government tells us how terrible it is for an STE like the Canadian Wheat Board to exist here in Canada it is likely to approve the entrance of a Chinese STE into our market. On the positive side Harper has claimed that they will push the final decision back 30 days (into November). The government is going to take the extra time to create a framework for this type of foreign takeover. This is long overdue; it will finally get rid of the “net benefit” stipulation which is the political equivalent of “if we feel like it”. My hope is that they do it properly and completely. Right now people are saying that 5% is okay to sell, but we need to set specific guidelines. Can one foreign entity own 5 companies in Canada that each account for 5% of oil sand operations? 10 companies? Do we limit companies by their country of origin? Does it matter if they are state owned or not? Will the limits be firm or will they be altered in each trade deal we negotiate? There are a hundred more questions we need to answer. The CNOOC-Nexen deal is worth about $15 billion and has taken up most of the recent headlines but it is just the appetizer for the feeding frenzy to come. There has been almost no talk about the fact that Oil and Natural Gas Corp and Oil India Ltd, along with refiner and retailer Indian Oil Corp have put in a $5 billion bid on a share of the oil sands owned by ConocoPhillips. All three are STEs operated by the Indian government. The framework that is promised along with the CNOOC-Nexen decision needs to lay down exactly how Canada intends to handle these cases. We have the third largest supply of oil in the world; if Harper wants to diversify away from U.S. exports he better make sure we are ready for it. To celebrate labour day people in Quebec will be voting in a provincial election. The election takes place on September 4th. The current government is the Quebec Liberal Party (QLP) lead by Jean Charest. The other major parties are the Parti Quebequois (PQ) lead by Pauline Marois and Coalition Avenir Quebec (CAQ) lead by Francois Legault. In the most recent polls the PQ have a slight lead with 32% of the vote. I thought it would be a perfect time to take a look at the things being said by the leader of the PQ just in case there are any readers from Quebec that are not aware of her positions. I will take statements from a speech made in Montreal this week. Yes that’s right. She will fight to give Quebec its independence. Although most polls show the support for a referendum somewhere down near 28% we need not worry about that because Ms. Marois will fight for it in any case. She is planning on raising the mining royalty in Quebec from 16% to 30%. She did not mention that this would make Quebec one of the most expensive places on earth to mine, but I am sure she is aware of that fact. In that statement she is referring to paying for a tuition freeze. She supports the student protests and has promised to make sure that there is no increase in tuition. Those two statements alone should make it clear that the PQ is not the party to vote for but then again, I think for most Quebec voters this election is more about NOT voting for the Liberals (who are sitting at 26%). The CAQ is polling at 28% of the vote which places it in second. Francois Legault used to be a member of the PQ and fought for Quebec independence. He now says that if his party gets the majority that a referendum would be taken off the table for at least 10 years. His platform is based on saying that the PLQ is corrupt and the PQ is under the influence of the unions. He claims that his plan will save 2.5 billion dollars in the first year. This party is less than a year old and so has no political history. This might be to its advantage because no history is better than bad history. This is obviously not a comprehensive examination of the parties but I felt it necessary to at least point out some of the basic facts. I will not give an official webernet.ca endorsement to a single party but I think the responsible decision here really is between the QLP and the CAQ.